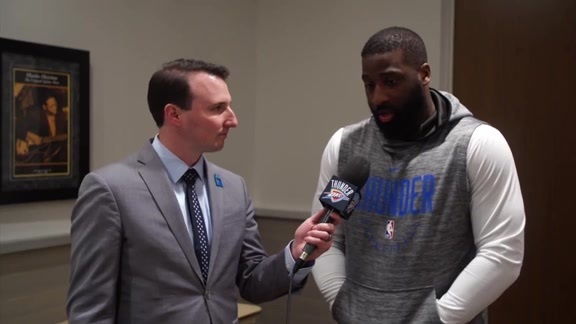 During pregame warmups, Russell Westbrook called over reserve forward Patrick Patterson and gave him a very straight forward message: “Shoot the ball”. It was as much an instillation of confidence as it was a directive. Turns out it was an effective message not just for the Thunder stretch forward, but the entire reserve unit. Patterson had a perfect shooting night, going 4-for-4 from the field, 2-for-2 from the three-point line and hit his lone free throw attempt on his way to 11 points as the Thunder’s bench racked up 48 total points to bolster a 112-105 home victory over the Orlando Magic. “Especially in the huddle. Definitely a lot in practice. Outside of the facility. And outside of the arena. So, I might as well shoot it,” Patterson deadpanned when asked about Westbrook’s verbal encouragement. It wasn’t a straightforward win for the Thunder, who had to battle through a challenging first quarter when the Magic ripped off 6 three-pointers on its way to 38 points. Some loose Thunder defense on pick-and-pops between DJ Augustin and Nikola Vucevic led to open looks from the perimeter, and the Thunder was immediately on its heels from the outset. It was a long climb for the ensuing two quarters as the Thunder clawed its way back into the game. First, Head Coach Billy Donovan made a defensive adjustment to trap the ball to prevent those easy kick back passes to Vucevic, which required some extra built-in help on the backside of the defense. Behind a monstrous one-handed block by Alex Abrines as he came over for a rotation, plus a three-pointer and a backdoor lob dunk for the Spaniard, the Thunder got back to an even keel. Blocking, splashing, slamming. @alexabrines leads Q2 comeback. After pulling to within one point at 62-61 at halftime, the Thunder outscored the Magic 23-15 in the third quarter behind an outstanding defensive performance. Despite turning the ball over 8 times in the period, the Thunder allowed just 2 fast break points to Orlando, and ripped off a 9-0 run to end the quarter and take control of the game. The burst started with two free throws by Jerami Grant, who is managing to serve as the backup center while also seeing other minutes as a small forward in crucial portions of the game. After Grant’s shots at the charity stripe, George made a steal and kicked it over the top to rookie Terrance Ferguson, who grabbed the pass off the bounce in front of him, while on the way up towards the rim, and slammed it home. 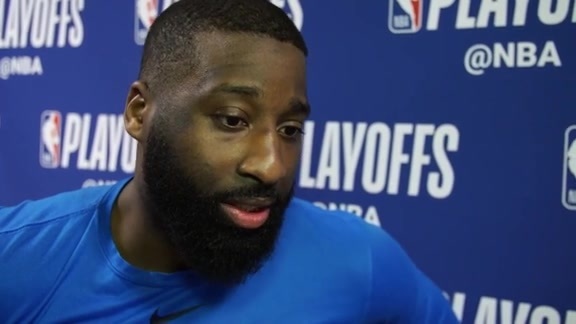 Next Raymond Felton banged home a three-pointer off beautifully executed ball movement, and George attacked the rim for a putback of his own miss through contact. It was a bulldog play to send the Chesapeake Energy Arena crowd into a frenzy. Despite building a 13-point lead midway through the fourth quarter, the Thunder still needed to hang on down the stretch. Orlando pulled back to within four points with 1:29 remaining, but a corner three-pointer for George off of Russell Westbrook’s 11th assist of the night. Oklahoma City’s floor general came up two points shy of a triple-double on the night, but that was far from his mind. He was simply grateful for another Thunder victory. “I’m just blessed to be able to play, have fun and win,” Westbrook chimed.